Nowadays we see a number of technological advancements are there and a number of television channels are showing a number of Television serials on daily bases. Some of them are quite good of course. But we feel for the others that they lack the soul. If there is no great content than just having better sets, high quality special effects and number of characters and actors cannot deliver a great TV serial. That is the reason why some of the TV serials which were telecasted a long ago, produced with the tight budget and limited resources and technological stuff but strong at content, performances and representation; are still alive in the audience’ mid and people love watching them again (and again). Providing entertainment should not be the sole motto of a TV serial and the family is expected to watch it, so there must be some moral and quality oriented stuff should be there. It must be a package which provide entertainment without loosing its characteristics. In episode 5 of Akbar & Birbal Hindi TV serial, the case of a man who was considered as cursed or unlucky is explored. It was considered by the people that if you encounter with him or even see him something wrong will definitely happened to you without a doubt! Let’s explore the content briefly and see how actually a social problem is explored and tackled by Birbal and Akbar. This is an effort to balance the society by eliminating some blind beliefs (Eg. to consider someone cursed and the reason of something bad happened, without a reason) which are senseless, so we need to overcome them and consider each human as equal by all means. We should applaud the the makers to bring such thing to attention nicely. Fanne Khan with his two assistance was wandering in a village near by. He see there was a chaos all of a sudden and people were running from one place to the another like the barking dogs are behind them to bite brutally. When one of his servants have stopped a running fellow and enquired about the matter, he got to know about a person who is considered as cursed is approaching and that is the reason that everyone is running towards their destinations to avoid facing that fellow. He even explained in detailed and that whoever sees his face by any reason, definitely something wrong happens to him/her. The person ran away then. FanneKhan considered this belief as baseless and was keen to see that fellow. However there are some shortcomings in the persona of Fannekhan and here also he is trying to be oversmart by doing something which he is advised not too, but anyway this is something good we have seen in him! FanneKhan’s assistances tried stopping him from facing the fellow but he was firm on his decision. He then see the person coming. One of his assistances have covered his own face to avoid the guy but FanneKhan asked that cursed fellow to show him his face. FanneKhan then see his face and joyed. He at the same time found a beautiful lady at a well nearby. He was overjoyed and asked his assistance that the guy is rather lucky for him. The girl’s name was Bindia and FanneKhan started flirting with her as per his nature. When following her, he got slipped in the mud due to the wet surface there and his attention was not there.Well, everyone including himself now thought the reason behind the mishap is nothing else but the meeting(!) with the cursed person. Akbar was talking to a Mulla (Mullah) and a Pundit, two holy men belong to two different religions. He then reaches to the conclusion form his discussion with them that all the religions spread the same message and whatever the way is but the all the paths lead to the same destination. At the same time Fanne khan reaches there and meets Akbar and Shahbano. After hearing about the incident Akbar sked the Mulla, the Pundit and Birbal and other courtiers about their views about the incident. One of the courtiers confirmed that he also have heard about one such (cursed/unlucky) man living in the village near by. There are so many people who experienced wrong things happened to them after meeting that person. Such a large number of evidents cannot be avoided rather. Birbal however consider this as simply a co-incidence and there is no such thing exist. One should think above such (stupid) things. The mullah and the pundit agree. In fact the emperor Akbarhimself also considered these rumors as humbug and to prove that, he asked his servants that he wants to see the face of that unlucky man as the first thing the next morning. Courtiers and Begum tried stopping him from taking such risk but Akbar was firm on his decision. He wanted the people to come out of such prejudices and wrong beliefs. He then orders to remove all the mirrors from his palace as well. So whatever circumstances will be, the next morning he will see the face of that cursed person as the first thing (not even his own face). What happpened then? 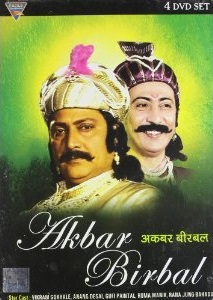 Does anything wrong happened to Akbar by seeing the face of that cursed fellow the next day? Will Birbal face any challenge here? Well, better to watch it on your own. Apart from wit and wisdom, this episode explores a social issue and it is important to see how wrong beliefs harm not the individuals only but the entire society. One needs to overcome that. An episode delivering such nice messages like all religions are equal, all humans are equal etc. is a must watch thing. The performances of the seasoned actors make it even more delightful experience. The cursed person is a little unnatural but that is a really small drawback which can be avoided of course.